Brie is by far my favorite type of cheese. Its tangy nuttiness blends perfectly with anything and everything, from sweet to savory. 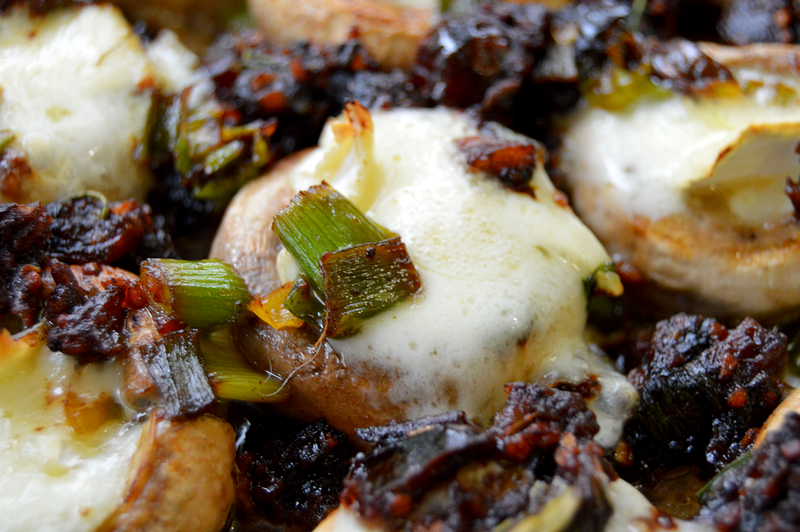 This recipe combines the best of all worlds, finding savory in the mushrooms and sweetness with the date and green onion topping. This recipe is just as simple as it is elegant. 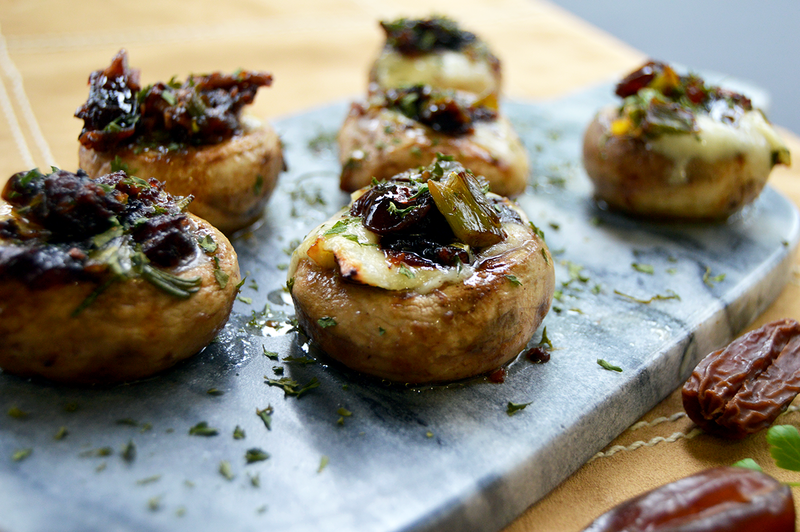 Made with fresh ingredients like rosemary and button mushrooms, these mushrooms make for an incredible appetizer or side dish. 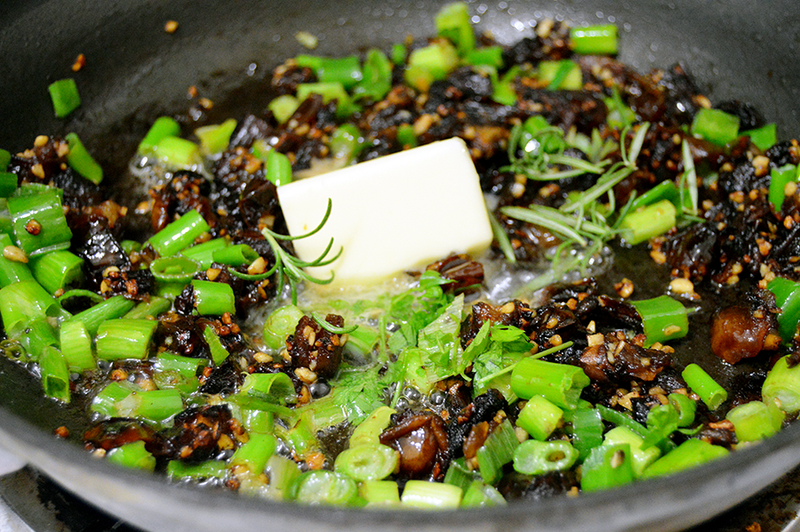 Start by sauteing the dates in the butter until they have softened. 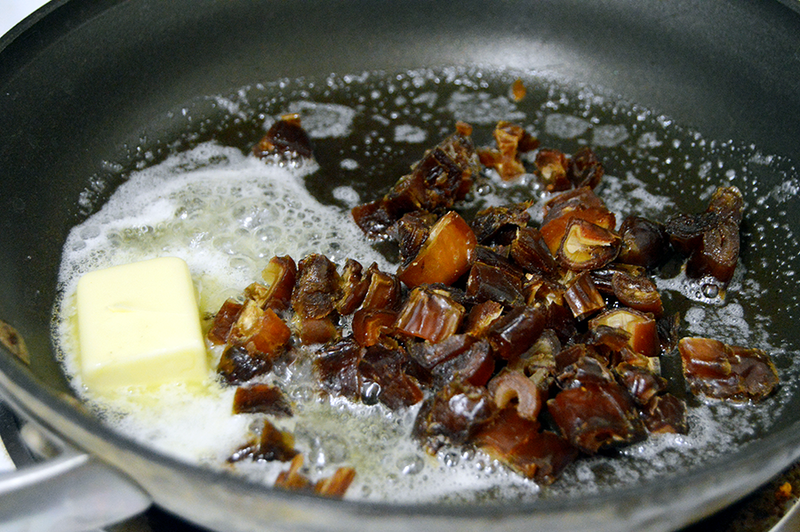 If you are using dried dates, refresh them for a few minutes in a water bath prior to sauteing. Add the remaining butter, green onions, garlic and rosemary to the pan with the dates. If using, add the chopped habanero. Splash some wine into the pan to deglaze it while you scrape up the brown bits. Reduce the heat to low and let simmer for a few minutes to let the wine evaporate as you start preparing the mushroom caps. In a clean pan, heat a tablespoon of oil over medium heat until it shimmers, then add the caps, either side first, until just beginning to brown. Once browned, flip the caps to repeat the browning on the opposite side. Take care to only brown the mushrooms for a few minutes, or else the mushrooms might become too soggy to transfer to the baking pan. Aim for about 45 seconds to a minute per side. 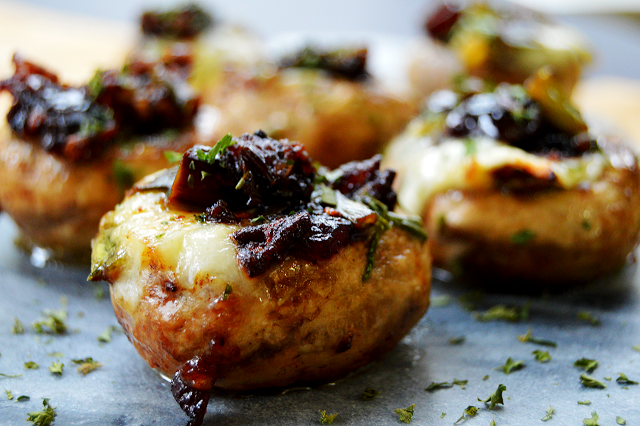 Chop the brie into cubes that are just small enough to fit inside each mushroom cavity. 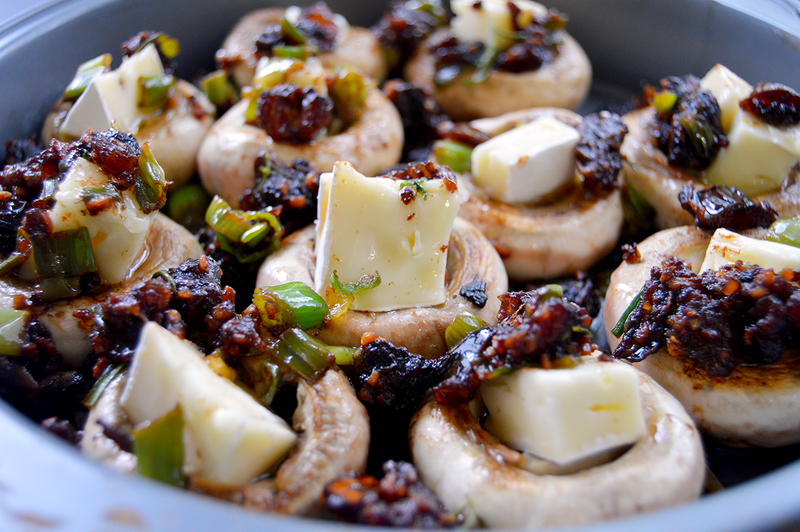 Arrange the mushrooms into a small baking pan and cover with the date and green onion mix. Bake the caps for 10-15 minutes, or until the brie has completely melted and the tops are beginning to brown. These puppies are ready to be served hot, room temp, or even cold. Some people prefer to let them rest for a while prior to serving, to really absorb all the flavors. However you decide to serve yours, just be sure to scrape up any of the date mixture and spoon it over each mushroom again when ready to present to your party. 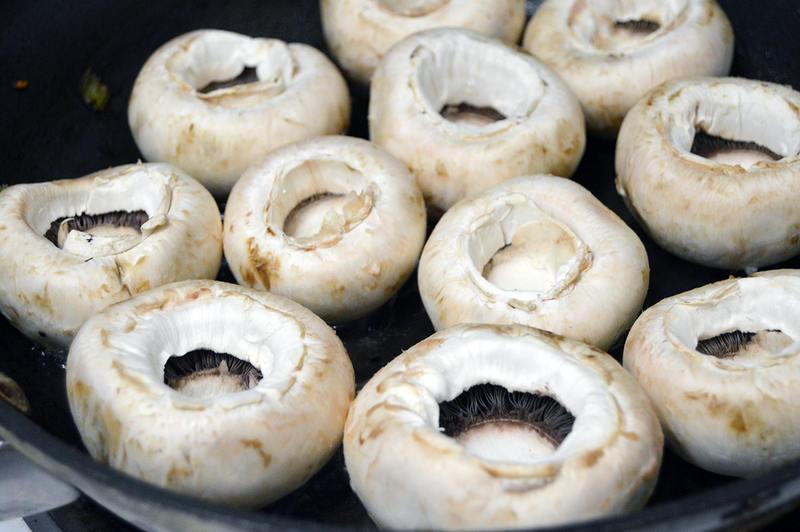 Preheat the oven to 350 F. Wash and dry the mushrooms, then pop out and discard the stems. In a pan over medium heat, add two tablespoons of butter then toss in the pitted dates and saute until tender. Add the remaining butter and green onions, garlic, and rosemary; stir until fragrant. Pour a splash of wine into the pan to deglaze it. Let the wine evaporate completely, while scraping up the browned bits, then remove from the stove. Next, add two tablespoons of vegetable oil into a small pan over medium high heat. Place the mushrooms in the pan, top down, and let brown for one to two minutes, then flip the mushrooms stem side down and repeat. Remove the mushrooms to a plate and let cool. Cut the brie into cubes about a half in thick - just small enough to fit inside the cavity of each mushroom. 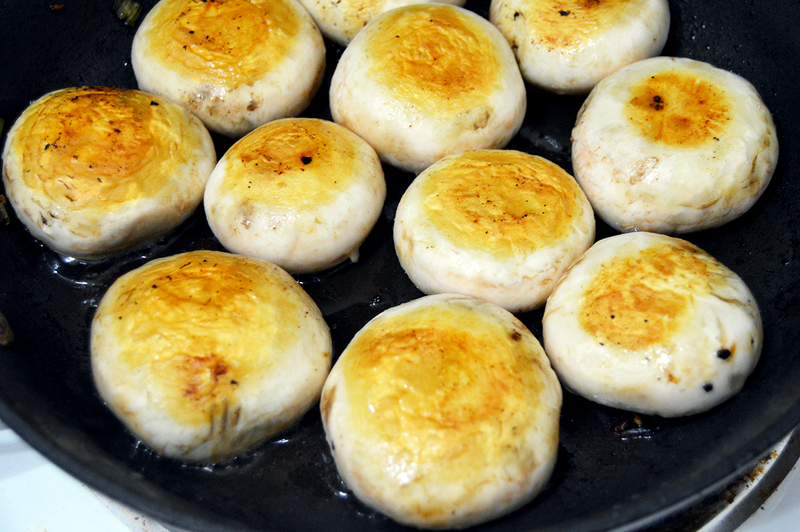 Arrange the slightly cooled mushrooms into a baking dish so the sides are just touching. 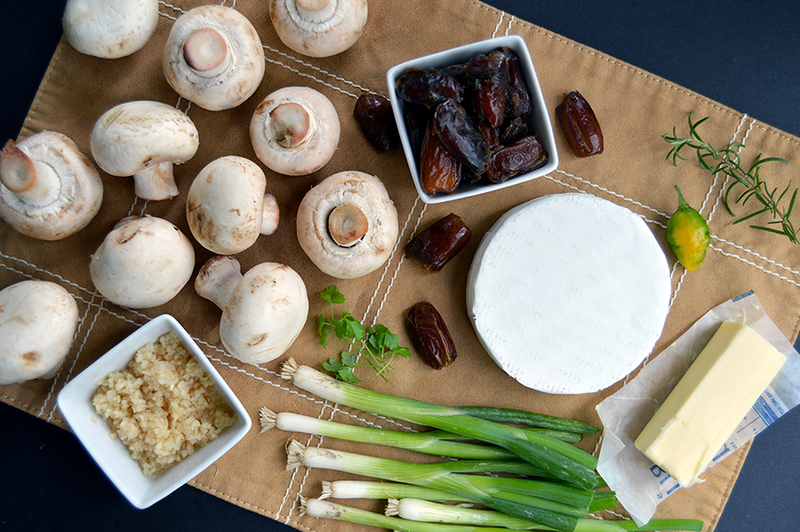 Press a cube of brie into each mushroom cap, then pour the dates and green onions over the mushrooms. Bake for 10 to 15 minutes, or until the brie is melted completely. Serve right away warm or chill for a few hours to serve cold. Sprinkle with fresh parsley for garnish.